This French patisserie and bakery is a quirky little joint that really takes you away from the hustle and bustle of Covent Garden and transports you to a beautiful Parisian cafe. The decor is really lovely too, just my kind of thing, with illustrations on the white walls and lots of flowers and cakes everywhere. BB Bakery had certainly made a great first impression on me. We were greeted by a very friendly waitress and shown to our table. She then came over with orange juice and let us ponder over what beverage we would like with our assortment of patisserie delights. Neither my friends or I are avid tea or coffee drinkers and thought ordering hot chocolate would be way too filling with all the treats that were about to come so instead we decided to be adventurous and go for “Red tea: Rootbush South African & 4 red roots“. The tea came in a beautiful ceramic tea pot painted with poppies. I loved that all the crockery they had was mismatched vintage looking pieces. The tea smelt lovely and despite my slight apprehension, it tasted quite nice too. I thought it was brilliant that they offer gluten free, halal & vegetarian options. The waitress came over to let us know that she was aware that we had asked for a halal option so none of the food would contain meat or alcohol. 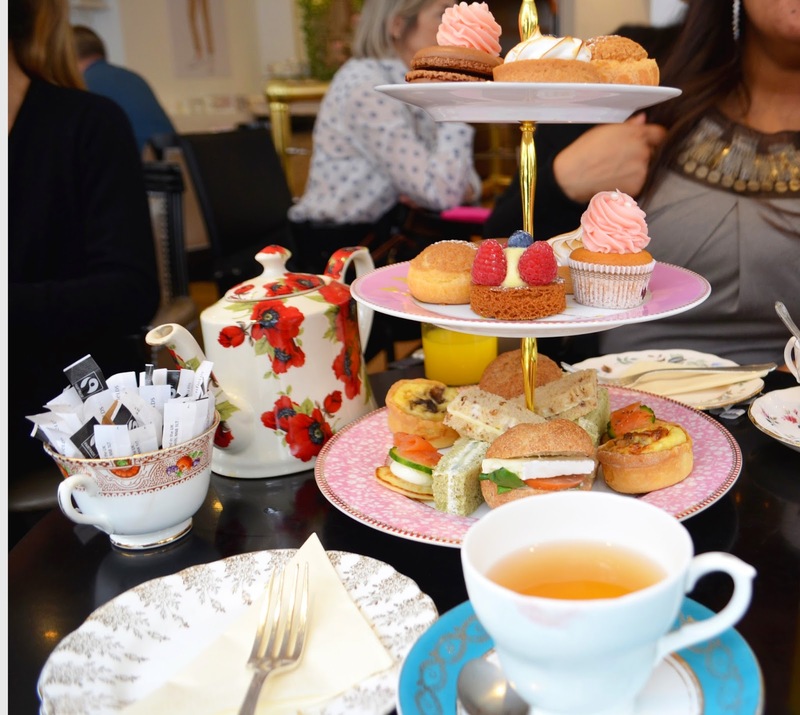 Once we had got stuck into our cups of tea the waitress bought over a cake stand full of sweet and savoury delights. My tummy was going to be extremely happy as there were blini’s, finger sandwich’s, cupcakes and of course macarons! Even when we worked our way through the entire cake stand, the waitress came over to ask if we were ready for our freshly baked scone’s. They were definitely my favourite thing to eat. Warm and soft in the middle, with cream and jam. Yum! I did find that the seating was a little cramped when the bakery was in full swing however that didn’t put a dampener on the trip as the atmosphere was still lovely. There is additional seating downstairs if necessary and judging by how busy it was I’m sure they would need it! You are also able to walk in and ask for a table however I would probably recommend that you book a table in advance to guarantee you get a table and save yourself a wait. The staff were all extremely polite and most importantly very attentive. They bought out the food and drink in good time and made sure that we were attended too. Overall my experience of afternoon tea was brilliant. I loved the atmosphere, food and service, it really had nothing to fault. I’m pretty sure I left the shop weighing a stone heavier but I can tell you, it was definitely worth it! Afternoon tea is served at £29 PP at the time of this post being written.